As of January 1, per a decree signed by Russian President Vladimir Putin, cargo bound for Kazakhstan from Ukraine via Russian territory must transit exclusively through Belarus. According to Interfax, the decree was signed in connection with another decree suspending the four-year-old free trade agreement (FTA) between Ukraine and Russia. Russia’s decision to suspend the FTA with Ukraine came in conjunction with the entry into force of Ukraine’s agreements with the European Union to gain tariff-free access to Europe. Russia maintains that Ukraine cannot belong to both the Commonwealth of Independent States (CIS) and European Union free trade zones. Moscow’s decision–that trade bound for Kazakhstan transiting through Russia from Ukraine must go through Belarus first–could have seriously detrimental effects on Kazakh-Ukrainian trade. 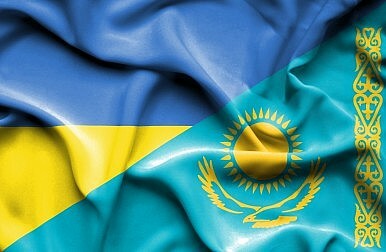 Ukraine has been one of Kazakhstan’s top five import partners fairly consistently over the past decade. In 2012, Kazakhstan imported nearly 3 billion in goods from Ukraine–third only to Russia ($17 billion) and China ($7 billion) and ahead of Germany ($2.2 billion) and the United States ($2.1 billion). In the past three years, that trade has dropped as tensions between Russia and Ukraine escalated, but not enough to lesson Ukraine’s importance to Kazakhstan. According to the Ukrainian Minister of Agricultural Policy and Food, Oleksiy Pavlenko, Central Asian states import 4 percent of all all Ukrainian agricultural exports. The Russian worry, of course, is that Ukraine may serve as a conduit for European goods into the larger CIS region. Much as Belarus has been accused of facilitating the re-export of European goods, Ukraine could become a node in the now illegal trade of foodstuffs from Europe to Russia. Russia added Ukraine to the list of countries subject to its food import ban a response to European sanctions on Russia. The food import ban generated dramatic scenes of bulldozers rolling over wheels of French and Italian cheeses and oranges dumped from the back of trucks into garbage heaps. From Ukraine to Kazakhstan, Avoiding RussiaNazarbayev the Mediator Sets Sights on Ukraine CrisisWhy the Trans-Caspian Transport Route MattersKazakhstan Deftly Balances Relations with Ukraine and RussiaIs This the Closing of the Kazakh Window Into Xinjiang?